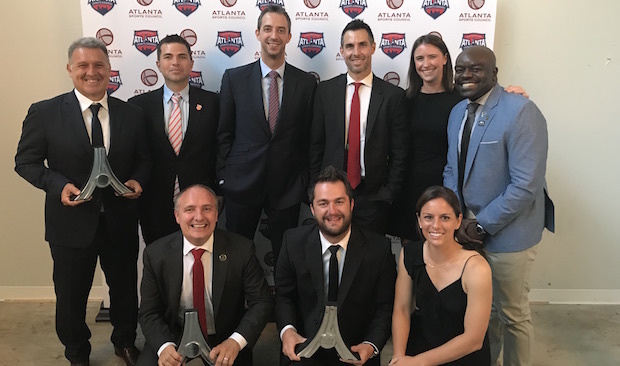 The 13th Annual Atlanta Sports Awards celebrated the athletes, accomplishments and memorable moments of the past year at The Fairmont in midtown Thursday night. Hosting the event were two of the city’s most familiar members of the sports media, Zach Klein of WSB-TV and John Kincaid of 680 The Fan. 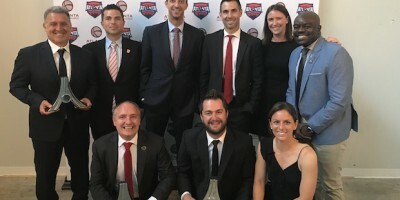 Atlanta United FC came out the biggest winner of the night and head coach Gerardo ‘Tata’ Martino beat out UGA’s Kirby Smart and Georgia Swarm’s Ed Comeau for Coach of the Year to open the show. College Athlete of the Year pinned UGA teammates LB Roquan Smith and QB Jake Fromm against Clark Atlanta track and field standout Jazmine Bowser. But it was Smith, UGA’s first-ever Butkus Award winner and the Bears’ first-round draft pick this year that accepted the award via video from Chicago. The College Football National Championship at Mercedes-Benz Stadium was named Moment of the Year, edging out Atlanta United’s Bobby Dodd Opener, The Falcons’ MBS home opener and the Braves’ inaugural game at Suntrust Park. High School Athlete of the Year went to Cartersville quarterback and current Clemson Tiger Trevor Lawrence. This was one of many awards that the state’s all-time record holder for touchdown passes and career passing yards received this year; Lawrence was also the 2017 Hall Trophy winner, the award given out to the ‘most outstanding high school football player in the United States’ each season. Atlanta Falcons guard Ben Garland was the winner of the Community Spirit Award. Garland attended the Air Force Academy and became a second lieutenant after graduation. He is currently a captain with the Air National Guard 140th Security Forces Squadron, based at Buckley Air Force Base in Aurora, Colorado. Garland’s commitment to serve the country, the local communities and one individual at a time is what moved the organization to name him Walter Payton Man of the Year in 2017. During the NFL’s Salute to Service initiative last year, Garland and the Falcons partnered with TAPS – Tragedy Assistance Program for Survivors – to honor those who gave their life and support the families they left behind. Garland represented fallen U.S. Air Force veteran Robert Dean during the initiative and grew close with his wife, Katie, and their young son, Cooper. During his acceptance for Man of the Year back on Dec. 11, Garland invited Katie and Cooper to join him on stage, where he then presented his sponsor family with two tickets to the Super Bowl last February. Katie and Cooper were once again in attendance with Garland, and Katie took the stage to give a touching and inspiring introduction to Garland, who received a standing ovation and proud round of applause from the crowd. Capping off the night was the Lifetime Achievement Award Presented by Coca-Cola. This year’s recipient was John Schuerholz, one of the most influential figures in professional baseball, and certainly Atlanta Braves baseball over the past several decades. The former club president and current Vice Chairman Emeritus of the Braves already received baseball’s highest honor with an induction into the National Baseball Hall of Fame in 2016. Schuerholtz gave a reflective look at his incredible career that began 53 years ago when he left working in education to take his first gig with the Baltimore Orioles. Schuerholtz then moved to Kansas City where he built the Royals franchise into World Series Champs in 1985. Schuerholtz thanked Ted Turner for his role in bringing him to Atlanta and then explained how he was able to turn the Braves into a respected franchise that ultimately won 14 straight division titles, a feat no other professional franchise has accomplished in any sport.